Back row: James Peleg and John Byron (not sure which is which), Mitchell Elmer, Oscar Lee, Harriet Isabelle "Belle"
Front row: Mitchell, Rutherford "Rudy", Harriet Electra, Rachel Ellen, Ida Jane. [S114] IGI, Hays, Mitchell Birth. [S200] Smith County Journal, March 6, 1913. [S42] 1900 KS Census, Hays, Mitchell. [S139] 1895 Census -- KS, Smith Center -- Mitchell Hays. [S174] Internet Posting, Bowen, Peleg. [S264] 1860 Census, Ohio, Jackson Co.
[S42] 1900 KS Census, Hays, Mitchell , ED 165, Sheet 5B, Line 98 (Mitchel Hays household). [S200] Smith County Journal, March 6, 1913, page 8, column 3. [S1408] 1870 U. S. Census, Iowa, Butler County, Shellrock Township, sheet 17/721, line 1, dwelling 127, family 134, Iowa, Butler County. 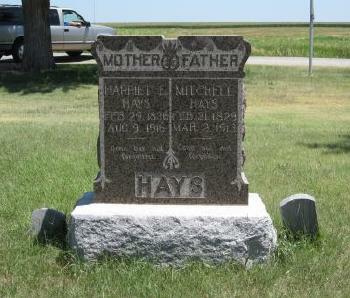 [S2001] Mitchell Hays and Harriet E. Hays Cemetery Marker, Fairview Cemetery, Smith Center, Smith Co, KS. [S242] 1850 Census PA, Mercer Co, Pymatuning Twp. [S62] LDS IGI, Hays, Mitchel. 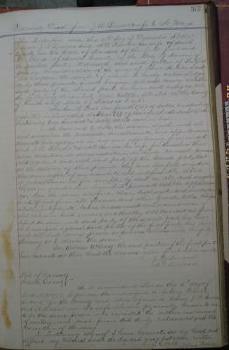 [S264] 1860 Census, Ohio, Jackson Co , page 21, dwelling 140, family 126, Mitchel Hays household. [S57] Book, History of Smith Centre , page 4. [S153] Chapman Advertiser, October 25, 1945, page 1, column 5 and 6, page 1, column 5 and 6. [S457] Smith County Pioneer, v92, n7, September 12, 1963, page 3, page 3, column 4. [S457] Smith County Pioneer, v92, n7, September 12, 1963, page 3. [S463] Smith County Pioneer, v80, n11, October 25, 1951, page 1. [S463] Smith County Pioneer, v80, n11, October 25, 1951, page 1, page 1, column 6. [S2084] Unknown short title: Deed Book Volume A. [S43] 1880 KS Census, Hays, Mitchell. 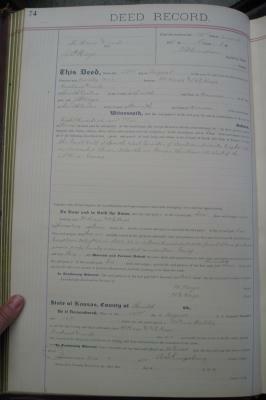 [S2084] Unknown short title: Deed Book Volume L.
[S140] 1885 Census -- KS, Smith County, Mitchell Hays , page 18, line 12, household 105/9 (Mitchell Hays household). [S2084] Unknown short title: Deed Book Volume X. [S139] 1895 Census -- KS, Smith Center -- Mitchell Hays , page 1, line 11. 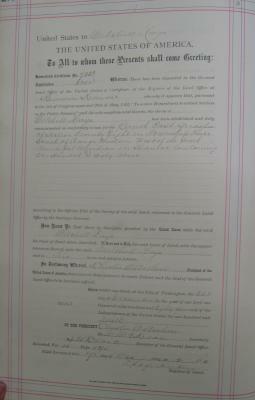 [S142] 1905 Census -- KS, Smith Co, Mitchell Hays , page 17, family 121, line 22. [S143] 1910 Census -- KS, Smith Center, Hays. 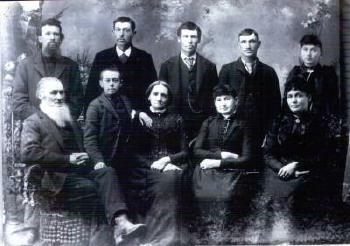 [S143] 1910 Census -- KS, Smith Center, Hays , dwelling 43, family 44, Mitchell Hayes household. [S197] Internet Posting, Shaffer, Charlotte Mitchel Hays. [S57] Book, History of Smith Centre. [S546] Smith County Pioneer, September 16, 1948, page 1, column 6. [S136] Family Group Sheet, Hays, John Byron. [S140] 1885 Census -- KS, Smith County, Mitchell Hays. [S151] Smith County Pioneer, September 25, 1902, page 1. [S144] IGI - birth, Hays, Oscar Lee. [S444] Smith County Pioneer, January 12, 1939, page 1. [S442] Smith Center Pioneer, November 9, 1893, page 3, column 2.